Hello! My name is Banden, and I made a thing! Planetary interaction is currently one of the features in the game that are in the worst shape usability-wise. The feature was released in 2010 with Tyrannos along with EveGate which led that expansion to be heralded by players as “the facebook expansion”. It has not seen any improvements since then and certain bugs in the UI has persisted. 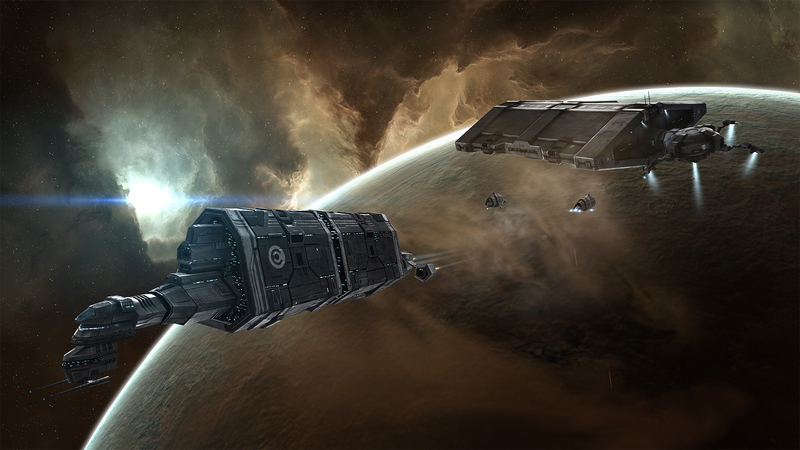 Despite the deficiencies of planetary interaction, planetary goods are being used in an increasing number of constructions with the roll-out of citadels. This creates the issue that players are increasingly encouraged to use a feature, which is not functioning to the best of its designed intention. Planetary interaction is an automated assembly line. It is supposed to be a way of making ISK which is low yield but also low effort. However, as a result of the way the interface is designed, the user experience of this passive low-maintenance activity becomes very complicated and tedious. My take on it as a long time user of PI is that you need to throw efficiency out the window to win, and this doesn’t seem right. I think there are some systemic issues with the feature but for now I would like to focus on the interface. It seems like the issue with it is that it allows you to micromanage every single unit within the colonies when in fact what the user actually needs the interface to do is to macro-manage colonies as whole. This deficiency makes the whole thing much more complicated than it needs to be. This little project of mine started when I was considering what could be done to improve the the user experience. What I came up with were some simple quality-of-life fixes for the current interface and from there I ended up making some of those suggestions as mockups in Photoshop. This article is a compilation of these small fixes, as well as a concept for a full revamp of the interface towards macro-management. It doesn’t quite replace every part of the current interface (yet! ), but focuses on making setup and day-to-day maintenance less tedious. Let’s start with quality-of-life fix #1: The Planetary colonies window. Get rid of the spreadsheet. Certain windows are difficult to present in any other way than a spreadsheet but this is not the case. Provide information that helps the user to better distinguish colonies from each other. Products produced could be a useful piece of information to have. A “Warp to” button which warps you to the customs office could also be nice with the alternative being to replace the Planet right-click menu with the Customs office right-click menu. A majority of the planets’ right-click menu is not really used for anything anyway. Quality-of-life fix #2: The Customs office. Get rid of the damned dropdown menu for launchpads. You will never have so many launchpads or resources that a simple scrollbar is insufficient. There is also a bug with the customs office where it randomly closes the window when you transfer a resource which would be helpful to get fixed. 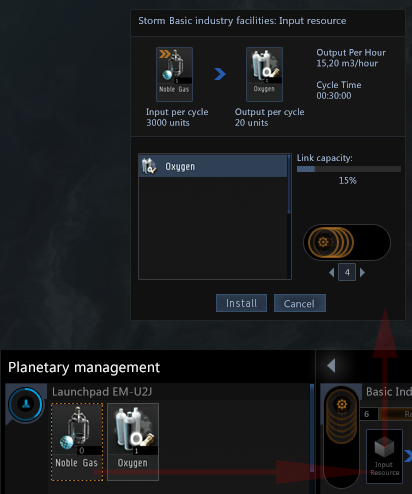 This is the main planetary management screen. One thing that I have focused on, is to make routes more transparent and streamlined. As you can see in the above, the Noble gas resource is represented with an icon but shows as 0 with a dotted line around it. This signifies that the resource is unavailable, but that there are active incoming/outgoing routes. This helps you to keep track of resources coming and going as well as to distinguish which launchpads are routing which resources. The excellent thing about including every structure into one interface, instead of one interface for every structure, is that it simplifies a lot of things. Routing can be accomplished with drag and drop actions and a visual cue. That is the chevrons you can see in the extractor window. Expedited transfer which is currently a monstrously complicated window, can be accomplished with a drag and drop action. Quality-of-life fix #3: Mass selection of industrial facilities. It would improve the setup phase by a dramatic amount if you didn’t have to select schematics and routes for every single facility. There hasn’t been a strategy game in the past 20 years that didn’t have mass selection. Just sayin’. With the way I did it in this revamp, industrial facilities are grouped together depending on which kind they are and what they are producing. This makes it easy to see status and to perform actions on more than one facility at a time. Including all structures in one interface also allows you to have continuity in the setup phase and you don’t need to click around because the functions you need are spread on a dozen individual windows. All the things you need to set up are provided. Selecting schematic and routing resources can be coupled so you can do both with the same action. The Extractor window provides summarized information about the running program as well as letting you drag and drop to route the produced resource. You can also double click the icon in there to open up the extractor program setup window. I also included a “Rerun program” button for those times where you don’t really need to move the extractor heads. 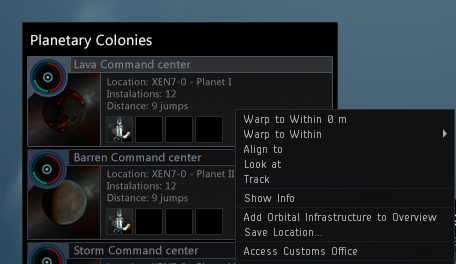 In general double clicking any structure on the management window should center the planetary view on the structure. As it is, whenever you click a colony in the planetary colonies screen it centers on the command center, which is often not very sensible. It would be really great if some development time could be allocated to planetary interaction. It is a really nice feature and the idea behind PI is great but it’s let down by its user interface. I hope this have given some food for thought for a rework of the UI somewhere down the line. That’s about all i got for now. Thank you for reading. If you have any critique or suggestions don’t hesitate to comment here or on reddit. Banden Lokemir fancies himself a bit of an armchair game-designer. He has more ideas than you can shake a stick at, with varying degrees on making sense. When he’s in space he fights, kills and reps for his right to be a carebear. He is a seeker of all things shiny and valuable.